Square has been highly volatile over the past few trading sessions. Here are a few scenarios on how to trade it. In late December, when Square (SQ - Get Report) stock was trading for roughly $50 a share, the stock was down roughly 50% from its highs made in October. While admittedly a horrid decline, it's not as bad as some of the other names in tech. Specifically, names like Nvidia (NVDA - Get Report) and Roku (ROKU - Get Report) did worse. Still, though, it's not a mark that Square bulls hold with pride. Even Square bears weren't looking for such a decline. I recall Real Money's Doug Kass flagging the name as a short candidate just before its decline began in earnest. At the time, he was looking for a pullback to $60. The selloff accelerated dramatically when CFO Sarah Friar -- someone who Jim Cramer really liked in the CFO role -- announced her resignation. The bad news was obviously that a gem of a CFO was out. The good news was that it wasn't due to accounting issues, but rather, so she could become the CEO of Nextdoor, a hub for social networking. In any regard, shares of Square closed up 11% Friday, at $58.21. The big rally follows a 10% decline from the prior day, where most U.S. equities were under pressure as well. Helping spark the move? A new CFO. Square announced Amrita Ahuja would take over the role after resigning as CFO from Blizzard Entertainment, a segment of Activision Blizzard (ATVI - Get Report) . It's causing investors to ask the obvious question: Is the worst over for Square? Bouncing off $50 was a relief for bulls, even though it's not all that surprising. $50 dates back to November 2017, a sort of "blow off top" back when SQ was in full-blown rally mode. To see that mark buoy the name now is a positive start. However, we're up a quick $9 per share, not giving bulls much time to react. $60 may not be much of a significant level, but downtrend resistance (blue line) certainly is. Should this level hold SQ in check, we need to see what level of support comes into play. Should it get there in the next few sessions and Square consolidates just below, then more upside may soon follow. 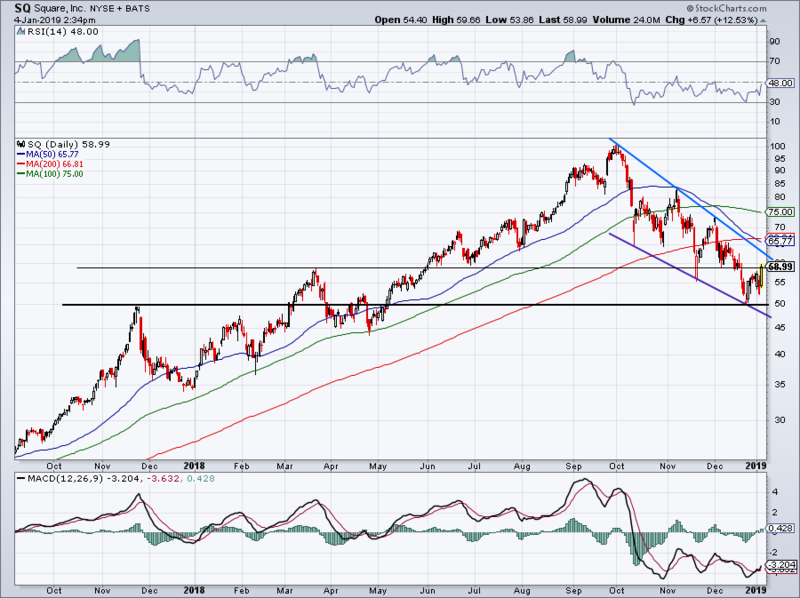 If resistance knocks it back down to $50, Square's back to a make-or-break scenario. Holding up near $50 gives bulls a solid risk/reward opportunity, while a breakdown likely sends it to downtrend support (purple line) near $45. Should resistance hold Square in check but the stock doesn't decline to $50, SQ has a chance to put in a higher low, a bullish development. That would give me more confidence in Square pushing through downtrend resistance in the future, provided the overall markets are holding up as well. While Friday's bounce is encouraging, investors shouldn't be blind to the fact that Square still has plenty of overhead resistance.